Things continue with the Symmetrical English 1.c4 c5. Of course, books could be written about simply this position and they have been! Our task is above all to provide a first overview and it has been undertaken in three videos by the top trainer Adrian Mikhalchishin. After that, English grandmaster Daniel King shows you in two videos systems in which Black does not go in for ...c5 or ...e5 but prefers to set out along different paths. Then it is over to Lars Schandorff again to explain to you the ideas of Réti. In three videos he provides a cross-section of this opening which is so rich in content and ideas and which is in fact the classic flank opening of them all. Another video has been contributed by the Slovakian grandmaster Lubomir Ftacnik. These are followed by videos by Daniel King on the King’s Indian Attack. This system, which can also be reached either via 1.¤f3 or via 1.e4, may well be more of a universal system than just a flank opening, but from the point of view of the ideas it was more suited to this volume. The same is true of the Dutch Defence, which many of you probably expected to see in the third or fourth volume. But instead of unnecessarily forcing material into that particular mould, FM Valeri Lilov now offers you in three videos a survey of the Leningrad System, the Stonewall and the Classical Dutch. We bring it all to a close with some openings which no longer belong to the main arena of opening theory but which nonetheless provide pleasure over the board and can really all surprise an opponent from time to time. This would include the Bird Opening (or Dutch with colours reversed), the Larsen System (1.b3) and the Sokolsky Opening (1.b4). The extravagant Black Knights' Tango, the Van Geet Opening (1.¤c3), the Grob Attack (1.g4) and the English Defence. Your best plan is to go into this area without any prejudices and allow our authors to surprise and inspire you. These openings are presented by Valeri Lilov, Lawrence Trent and Daniel King. As usual, the accompanying booklet is designed to give you a short overview of the openings. 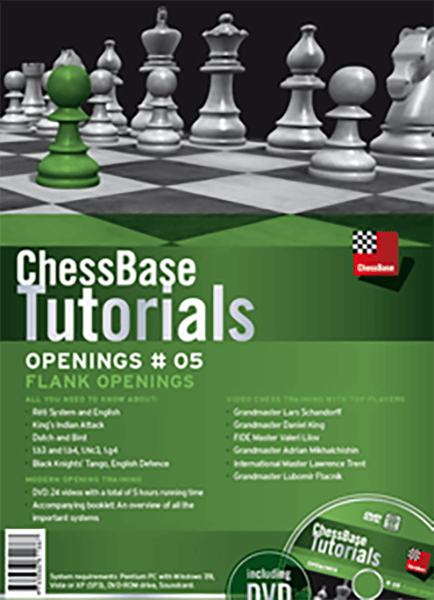 In addition the DVD contains a database with 100 famous games involving the openings dealt with.